Boat Description: Pontoons with bimini tops and rails that partially enclose decks leaving 1' - 3' of open deck forward of the front gate. Each cover has two sewn in pads for use with our boat cover support pole (ordered separately). Separate motor cover. USA and Canada Only. See International Orders for all others. To close this window click here or in the upper right corner. Please Note: We have several brace kit options that are selected automatically based on your stainless steel upgrade preferences. We do this automatically to ensure the brace kit matches your customized top. Every bimini top comes stock with front and rear nylon support straps. However, adjustable support braces can substituted for the rear straps, adding extra support and giving your new bimini top a very custom look. Our support braces are constructed from heavy-duty, anodized, aluminum tubing and are secured to the bimini and boat with rugged nylon fittings and stainless steel screws. Designed for tops with a 7/8" Diameter Tubing. Fully adjustable from 22-44 inches. Bimini braces come 2/per package, allowing you to support both sides of the bimini with one kit. Adjustable support braces also allow the top to be stored in an upright position. The braces and a storage boot will work together, storing the top in the upright position, similar to a radar arch. This form of storage can be very useful for cruising or trailering the boat at speeds greater than 35-40 mph. With our Stainless Steel Fittings Upgrade, ALL nylon bimini fittings on are upgraded to high-quality, corrosion-resistant, stainless steel hardware. Stainless steel fittings are a great way to strengthen any bimini top and simultaneously give it a polished custom-look, without costing the high cost of a Full Stainless Steel Upgrade. Aluminum slide tracks are a great bimini top accessory for people who need to move their shade from bow to stern (or visa-versa). This comes in handy for shading fore or aft seating while fishing, mooring, or at anchor. Often times, the seat you use to drive a boat is not the same as the seat you want to use for fishing, napping, etc. Mounting your bimini top to slide tracks allows you the flexibility of relocating your top as needed. 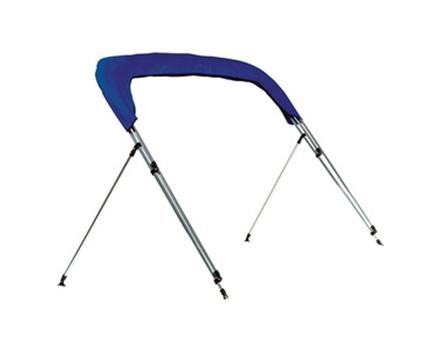 This bimini top accessory is available upon checkout with the purchase of a new bimini top. Slide tracks are available in 2', 3', 4', and 5' lengths. If necessary, the aluminum rails can be cut down in the field, during installation.